You get bombarded in blogs, forums, RV magazines and seminars that it is important your tires are properly inflated. Sounds like good advice, but what if you don’t have the equipment or aren’t sure how to check the inflation when one tire is behind the other and you can’t even see the valve i.e. rear dual tires as seen on almost all motorized RVs. Well I contacted the three largest tire manufacturers with a major presence here in the US and have some info about a large West Coast tire network. Here is what I learned and how you can find the nearest location that will check your air and adjust the inflation for free. One thing you need to do is to tell them the correct inflation that is based either on your actual loads and calculations as provided by organizations that specialize in weighing RVs like RVSEF or you need to know the minimum inflation as specified on your tire placard. I covered getting your RV weighed and how to know the minimum inflation based on the real loading and have covered the tire placard in a number of blog posts. You can re-read these by checking the Archive listing toward the bottom right of this page. Here is what I learned on how to get your tires inspected and aired up. Bridgestone Firestone said “You can stop at any of the over 1,600 Firestone Complete Auto Care Centers, 500 Tires Plus stores, over 90 Expert Tire or over 45 Wheel Works locations nationwide". They also confirmed “All our stores do free tire checks which include free air and a visual inspection of the tires.” To find the nearest Firestone Auto Care location check this link. Goodyear said: "We, like many tire manufacturers, have a combination of company-owned outlets and independent dealers to distribute tires in the US and Canada. Although Goodyear encourages all its dealers to offer free air for all types of vehicles, some dealers choose not to offer this service and some outlets are not equipped to handle larger RV's." To find the nearest Goodyear dealer check this link. Les Schwab Tire Centers in eight western states will check and add air to your car, truck or RV for free, even if you did not buy your tires there. Don’t forget you can always just check with the nearest tire store to see if they will do the service. 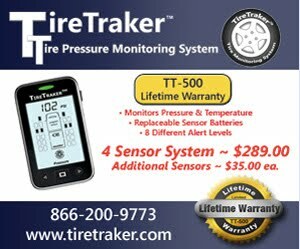 Once you find a tire dealer using one of the links above, be sure to call ahead to confirm they offer the service, what charge if any they might have for the service and that they can handle RVs as some stores might be able and willing to do a car or pickup but don't have the space for Class-A or trailer. I understand that tires should be checked at ambient temperature. Pressure is related to temperature, and driving will heat up your tires. Should you compensate for this? It is best to check tires in morning before they have been in the sun. If this is not possible then you need to wait at least 2 to 3 hours for the tires to reach ambient (again not in the sun). As I showed in my post on tire covers in June 2011, 30 min in full sunshine can raise tire temp by 30 degrees or more. Rule of thumb is 1 psi per 10 degrees F. At highway speeds tire temps can go 40 to 70 F above ambient (many variables). Difficult thing about compensating is that there is no way to know just how dry the air in the tire is so if you have high moisture the hot temp will be higher than if you have dry air. If you check your tires when cool and learn you need to add a few psi, make a note of how much each tire needs. Then when you get to location that has the high pressure air you need you would again measure the now warm tires and add at least the number of pounds you previously calculated. I would add one or 2 extra. That way when you next check the tires when they cool down you should be within a couple of what you need. I would not worry about +/- 3 to 5 psi as you should be running at least 3 to 5 above the minimum needed based on load and + 10% would not hurt as long as the cold pressure is not higher than the max stamped on the tires or higher than the wheel rating. Any RVer who hasn't figured out how to check their tire pressures is NOT ready to be out on the road! Yes, it is a sorry fact that there are many "tire shops" that offer their employees no real training when it comes to proper tire inflation. Have to remember that their primary job is to make a sale and to do mechanical services such as brake jobs and oil changes. How do you change a tire? Why are “bad tires” on the road?